If an Irishman came to America on St. Patrick’s Day, he might be a little bit shocked by the leprechaun outfits, green beer guzzlers, and yes, even the corned beef and cabbage. To be Irish in America is no rare thing—about 34.5 million people in the United States claim Irish heritage according to the 2011 U.S. Census, which is more than seven times the population of Ireland itself. Despite the sizeable Irish-American population, the dishes Americans perceive as “traditional Irish food” are not entirely representative of actual Irish food, according to many respected people in the Irish food industry. 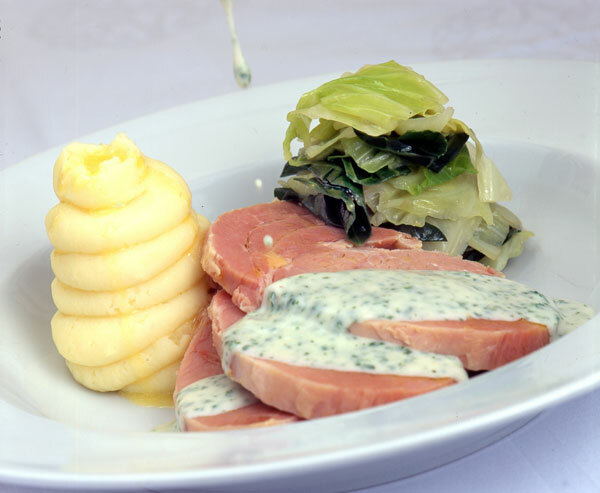 The first time Irish Chef Noel McMeel tasted corned beef and cabbage was actually in Connecticut when he was 20 years old. McMeel is the executive head chef at the Lough Erne Golf Resort & Hotel. “Some Americans still think we still live in straw houses and we all have a donkey and cart, just like in the film ‘The Quiet Man,’” McMeel said. Chef Darina Allen, owner of Ireland’s foremost cooking school called Ballymaloe, describes the country’s food culture over the past 30 years as a “food revolution,” with its artisan sector and farmhouse cheese makers emerging in prevalence. “Gradually, the perception of Ireland as the land of corned beef and cabbage is changing,” she said. Irish-American cookbook author Margaret Johnson, said that corned beef and cabbage is really an American interpretation of bacon and cabbage – a more traditional Irish food. 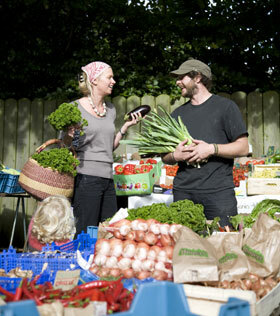 Though these are not the conditions modern Irish people deal with, those in the food industry are still very in touch with the land they farm. “We in Ireland believe very much that we need to be putting Irish ingredient-led cuisine at every point from farm to table,” McMeel said. He boils the Irish food industry down to five basic pillars: the quality of the food, ingredients and taste, the use of local and seasonal produce, the championing of local artisan producers, the personality of the cuisine and the service, and the hospitality and service. Though Allen said that the Irish are eating fewer potatoes than in the past, Chef Garrett Byrne, named Best Chef at the 2012 Irish Restaurant Awards, said it would be unusual not to get potatoes with your main course, even at a high end restaurant. Johnson added they are often served at home as well, fashioned in a variety of ways ranging from boiled to mashed to fried to a gratin. Before the introduction of the potato to Irish cuisine, milk, cheese, meat, cereals, and certain vegetables composed the Irish diet, McMeel said. After the early 18th century, no meal was considered complete without them, he said. The Great Famine killed nearly a million people over a span of five years in the mid-1800s. 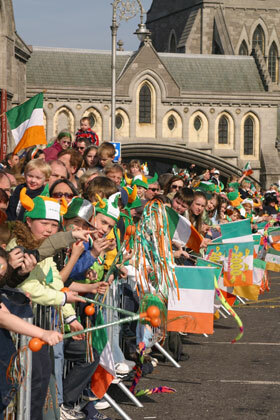 Oddly enough, Boston, not any city in Ireland, claims to have the oldest St. Patrick’s Day parade. Byrne believes that St. Patrick’s Day in general has become more of a holiday for foreigners over the years. However, Allen said that in more recent years Ireland has taken advantage of the tourism opportunity that St. Patrick’s Day provides, and March 17 has become more of a celebration. McMeel added that there will typically be someone playing music at the bar, and Riverdance style dancing ensues. Want to insult an Irishman when you're trying to celebrate St. Patrick's Day? 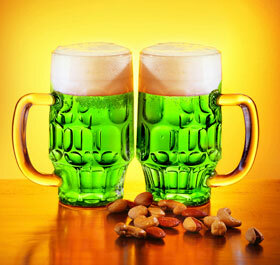 Drink a green beer. Though the off-colored beer could be considered controversial, America’s take on Irish soda bread has gotten a good review from Allen. She calls it “delicious,” though, “quite different to Irish Soda Bread, which is either brown or white.” She said the American version is closer to what the Irish deem ‘Spotted Dog,’ except with added caraway seeds. The Irish call it “emigrants’ bread”, she said. Some Irish people in the food industry consider hotdogs, burgers, and pizza to be “American,” but have learned from their own country’s faulty food stereotypes that America’s food culture has more to offer. Byrne believes that the Irish have a higher regard in recent years for American food largely due to the growing popularity of American chefs. “Irish people see America still as the land of great opportunity, as for the food they think fast food and shining lights. How we all dream to be there,” McMeel said. American cuisine has long been a combination of the culture of its people, so it is no surprise that America’s version of Irish cuisine is more of an adaption than a replica of traditional Irish food.